The Spalding County Correctional Institution Strives To Operate A Safe and Secure Facility. 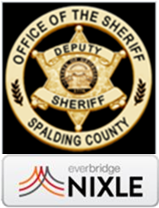 We Provide Services To Citizens of Spalding County With The Use Of State Inmates While Providing Healthcare, Education and Job Skills To the Inmate Which Reduces Recidivism With A Team of Dedicated And Professional Staff. From Atlanta, take 1-75 south to Hwy. 19/41south to Griffin. Take the Griffin bypass to the Williamson Road/Hwy. 362 exit and turn left. Take an immediate left onto Justice Blvd. Go to the top of the hill, Spalding County Correctional Institute (C.I.) will be on the left just before the Spalding County Sheriff's Department. From South of Griffin, take 1-75 North to the Jackson/Griffin exit. (#205) Head turn left, towards Griffin on Arthur Bolton Parkway. Go all the way through Griffin on the same road until you come to the intersection of Hwy. 19/41. There will be a Kroger to your left immediately before this intersection. Turn south onto Hwy. 19/41. Take the very next exit, which is Hwy 362/Williamson Rd. exit. Turn left and go under bridge. Almost immediately turn left onto Justice Blvd. Go to top of the hill, Spalding County C.I. will be on the left just before the Spalding County Sheriff's Dept. The original Spalding County Correction Institute (C.I.) began as a "work camp" in 1952 on the site of the present day Spalding County Public Works Department, just down the road from our present location which was built in 2001. 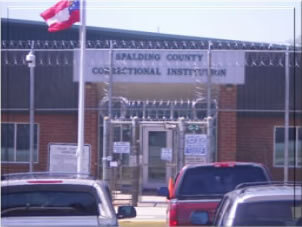 The Spalding County Correctional Institution (SCCI), serves to meet the workforce needs of local governments while fulfilling a contractual obligation to the Georgia Department of Corrections by providing safe and secure housing for approximately 384 inmates in compliance with all applicable policies and procedures. 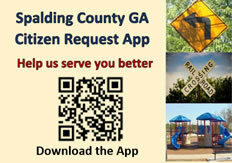 We are governed by the Spalding County Board of Commissioners thru the County Manager and also by the standard operating procedures of the Georgia Department of Corrections. There are approximately 65 inmate details with about 320 medium or minimum security state inmates assigned to work outside of the prison for a variety of local government departments as well as several in other nearby jurisdictions. Some of these departments include Public Works, Water Authority, Parks and Recreation, Animal Control, Construction and Maintenance, Griffin-Spalding County School System, Georgia State Patrol posts in Griffin and Thomaston, Ga., Georgia Department of Corrections Mobile Construction Division, Griffin Police Department, Griffin City Cemetery, City Water Department, City Motor Pool, City of Thomaston Public Works, Henry County Public Works and Fayette County Public Works. The majority of these "outside" work details are responsible for cutting grass and picking up trash on county roads, fixing or replacing road signs on county roads, laying asphalt, repairing some bridges, digging and cleaning out ditches, preparing ball fields, keeping local parks clean, working in the automotive and maintenance shops and providing janitorial services to many local government buildings. Another 55-60 inmates are assigned to "inside" details such as the laundry, kitchen, barber shop and dorm orderlies. State inmates at a county camp will almost always be within a few months or years of their release from prison. To that end, the Georgia Parole Board places requirements on inmates about certain classes and groups that they either must attend to satisfy some parole requirements or that they can elect to attend in order to help themselves. SCCI offers the following classes for inmates: G.E.D. preparation classes, a required class known as MRT, which stands for Moral Reconation Theory; Re­ entry skills classes, Motivation for Change and a computer lab. Religious services are also available for all inmates. The Spalding County Correctional Institute also provides On The Job training programs in landscaping, cooking, baking, janitorial services, small engine repair, sign fabrication, mechanics and laundry services. Additionally, a certificate program in Welding is available to qualified inmates through a partnership with Southern Crescent Technical College. What are the rules for visitors to follow? How do I send money to my loved one in your facility? How do I send a care package to my loved one in your facility? How can I get an inmate moved closer to me or farther away from my community? What should I do if I encounter inmates out in the community on a work detail?